A tourist visiting Oxford is awed by the grandness of the historic University of Oxford and its buildings. 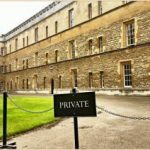 Use Oxford Walking Tours of Oxford University, Bodleian Library & City guide to understanding the medieval history of Oxford Colleges. The Colleges in the University of Oxford have big tower gates with a beautiful honey colored lime stone, puzzling links between the colleges, grand architecture and the biggest mystery for tourists was what it was like in the past. 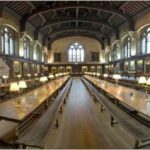 Today, Oxford Walking Tours of Oxford University, Bodleian Library & City guide will take you on a journey through the medieval time; the famous, historic colleges as the center for learning went on to jostle for space. The history of oxford Colleges is the monuments resurrected by the bishops and archbishops who were rich, powerful and wanted to leave a mark of their own will and determination on the university. The bishops were not necessarily religious and holy men but they were people who worked as the representatives of Kings and Queens. Many ambitious businessmen, as well as bishops and politicians, have continuously tried to influence the resilient and traditional colleges of the University of Oxford. Oxford City has been always influenced by the politicians but the university has gained weight over the city. During the medieval times, the Oxford City architecture and the University of Oxford had hidden codes in buildings. When tourists enter any college they will see a range of tall and large windows which means the “dining hall” when there are rows of big windows then it means a chapel, accommodations for students and fellows have a set of two windows or sometimes single windows in old colleges indicating living or shared accommodation. The kitchen is usually disguised as a squared building with chimneys, lanterns, wells, and pumps. 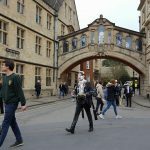 Oxford Walking Tours of Oxford University, Bodleian Library & City guide takes tourist to Merton College has many fine buildings from 1270-1380. Location of Merton College is extremely good because of its proximity to the Bodleian Library, Examination Schools, and Oxford City center. Tourist can visit this college from Merton Street which is cobbled and next to the High Street. In 1266-8 Walter de Merton bought four houses to accommodate students. Merton College has a quadrangle or quad which known as Mob Quad. For tourists, mob quad is a delight because of it is one of the few medieval buildings that tourists can visit in Oxford. In 1922, the mob quad was dug and walls were found below the structure which seems to be an “anchorite cell” attached with the church. There was a library in Merton College in 1320. Walter de Merton also brought a part of the land in Cambridge because he believed the if scholars of Oxford continued to have trouble with local towns folks of Oxford then they have to be shifted to a safe place in Cambridge. In 1546, King Henry VIII handed land of Merton College to newly founded Christ Church College in Oxford. This act of the King was seen as a land grab but no one dared to say anything to the King. Oxford Walking Tours of Oxford University, Bodleian Library & City guide tried to give some short information about the influence Bishops and Kings in forming the buildings and colleges of Oxford. 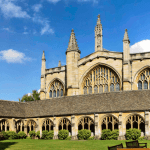 Tourist planning to visit Oxford City will not be disappointed by visiting Merton College.